The Medford Center for Orthodontics and Pediatric Dentistry is always looking for ways to provide you with the fastest, most comfortable, and most effective treatment. With that in mind, we are very excited to announce that our practice is one of the first in the area to have the state-of-the-art iTero® Element™ Intraoral Scanner. This technology makes it possible to create digital impressions for Invisalign® and other orthodontic procedures like Phase I corrections and Rapid Palatal Expanders. Impressions are necessary for us to know the exact position of your teeth as they currently appear in order to make a precise treatment plan. Traditionally, an impression for orthodontic treatment had to be taken using alginate. Unfortunately some patients had a problem with gagging or other issues that made the process very uncomfortable. The iTero® Element™ scanner resolves many of those problems. The new scanner is simply held over your teeth, where it will quickly and comfortably scan all sides to create a 3-D image that will be digitally saved and sent to a lab for the creation of your appliance or Invisalign® aligners. The iTero® digital scanning process only takes about 5-7 minutes. 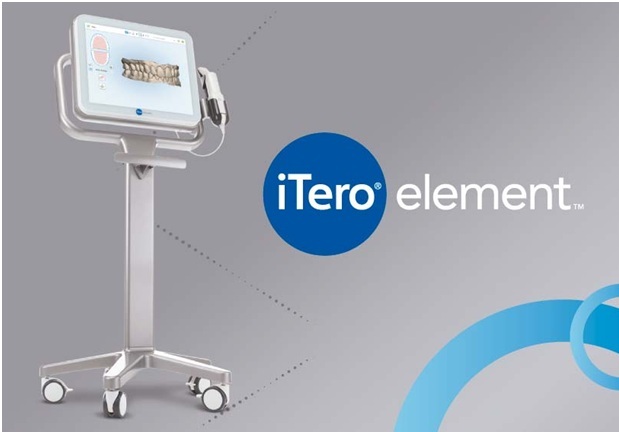 The iTero® Element™ also has a built-in simulator – we scan the teeth and create a simulation of what your teeth may look like in a straighter, corrected position. Basically, the scan can promptly show you how orthodontic treatment can improve your smile; giving you an idea of a procedure’s potential before you even have the treatment! The advanced The iTero® Element™ digital impression system can also be advantageous for patients who need retainers. In the past, we would typically take an impression and then create the retainer for the patient. That impression would end up getting damaged during the process of making the retainer, which means it would be useful only one time. This could be problematic because many people lose their retainers at some point and then ask if we still have the initial impression to create a new one. However, with the iTero® scanner, the first impression is saved in a digital file, so we always have an image of the patient’s teeth. In many cases, that image can be utilized to create a new retainer, without the need to take a new impression. Ultimately, this new technology makes the all-important impression process quick, convenient, precise, and comfortable. With the iTero® Element™ digital scanner, your first “impression” will be the best one!